1. In Irish mythology, a leprechaun (Irish: leipreachán) is a type of male faerie said to inhabit the island of Ireland. 2. There is no direct reference to Leprechauns in what are known as "ancient Irish tales". 3. They usually take the form of old men who enjoy partaking in mischief. 4. Their trade is that of a cobbler or shoemaker. 5. 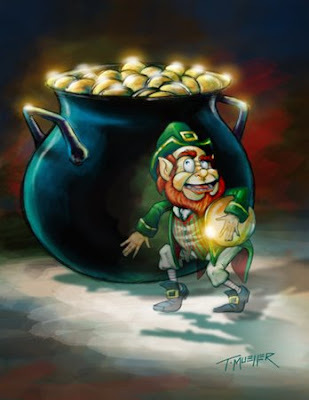 Leprechauns have also become self-appointed guardians of ancient treasure (left by the Danes when they marauded through Ireland), burying it in crocks or pots. 6. According to legend, if anyone keeps an eye fixed upon one, he cannot escape, but the moment the gaze is withdrawn, he vanishes. 7. If one captures a Leprechaun he must be truthful and honest and tell you where he has hidden his treasure. The Leprechaun although honest and obeying the laws is crafty. 8. Leprechuans really do exist. They are simply dwarves with an Irish background. 9. By nature, leprechauns are said to be ill-natured and mischievous, with a mind for cunning. Many tales present the leprechaun as outwitting a human. 10. The leprechaun originally had a different appearance depending on where in Ireland he was found. 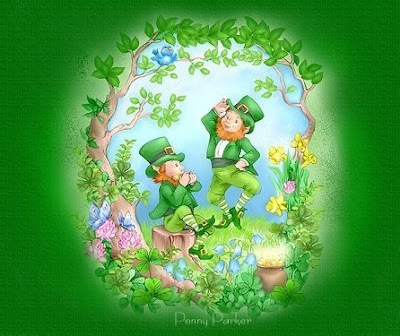 Prior to the 20th century, it was generally agreed that the leprechaun wore red and not green. 11. Yeats, in his 1888 book entitled Fairy and Folk Tales of the Irish Peasantry describes the leprechaun as follows:He is something of a dandy, and dresses in a red coat with seven rows of buttons, seven buttons on each row, and wears a cocked-hat, upon whose pointed end he is wont in the north-eastern counties, according to McAnally, to spin like a top when the fit seizes him. 12. The stereotypical image of a leprechaun bedecked in green is particularly strong in the United States, where it is widely used for a variety of purposes, both commercial and non-commercial. 13. There was also a pyromaniac leprechaun on an episode of The Simpsons, the aformentioned Leprechaun repeatedly told Ralph Wiggum to "Burn them all". IRish here through and through Love it Mary. Oh I waved to you when I saw the empire State bldg this weekend:>. You know, I think Yeats was describing himself on a different scale, which would completely figure! I have got the impression (already last year) that St. Patrick's is more celebrated in the States than in Ireland itself. At least there are far more decorations. So far I have never seen an Irish blog decorated for St. Patrick's, lol ! Excellent and informative TT - thanks for sharing. Very cute, as my novel is about fairies I have learned much of the leprechaun lore. Love the Simpson's leprechaun though....do we get another St. Patrick's theme next week too? I hope to meet a leprechaun some day, Miss Mary... doogies are allowed to hope for things like that, aren´t they??? As per instructions in #7: I must get me a little leprechaun... I'll share the pot of gold! I guess Saint Patrick's Day is right around the corner, I have a different take on it though, since we have a child with a birthday that day, it is all about her and cake and icecream! I don't remember learning most of this stuff -- but the comment about Irish dwarves almost made me lose it. That was great! Let me know what you think of The Gilded Chamber. My whole book club loved it. I can't imagine them wearing red instead of green! Is anyone old enough to remember the Bonanza episode called "Hoss and the Leprechauns"? It was hilarious! Have you read any of the books by O.R. Melling? In "The Hunter's Moon" there's a leprechaun that drive a car with a lot of shoes in the back seat. I am a regular juggler of leprechauns ya know. It's because the mittened kittens slide around on the floor when you drop them. These are fun and great fact about the Irish and leprechauns! I enjoyed reading this! March is such a fun month! We concieved all four of our children in March! I consider them my Pot-o-gold! However, December tends to be a very expensive month.